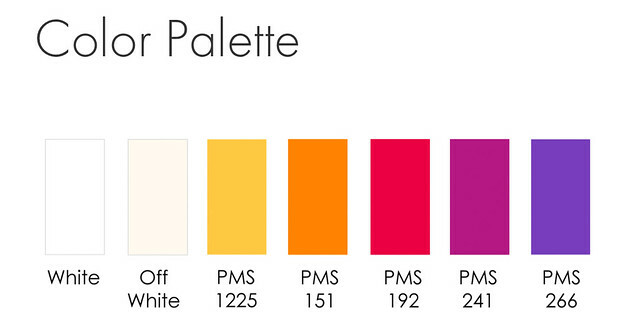 Or... Not So Mellow Yellow. 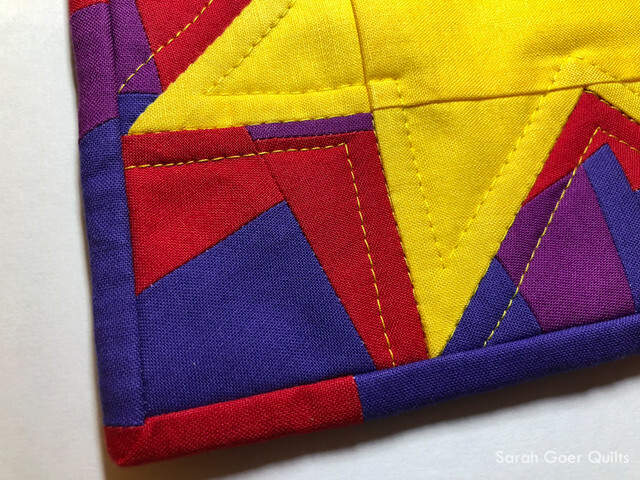 I knew this week's Project QUILTING challenge would be extra hard since I was leaving for QuiltCon on Wednesday morning. That left less than 70 hours for the challenge, including sleeping and packing. Step one, make it small. Maybe really small. I chose a simple, single star block. "Work small," as my friend Mel reminds me for short challenges. So, I decided on an 8-inch sawtooth star block. I wanted to use all the colors, which led to the decision to piece the background sections by building a slab from the non-yellow colors. I edited out the School Bus orange in favor of the three darkest values: Red, Geranium, and Bright Peri. Here's an accidental alternative setting. I dig this one too, but it wasn't what I initially had in mind and I wanted to stick with plan A. Once the block was pieced, I intended to add a border of the scrappy background and a yellow binding, but I would have had to build a new slab and I was crunched for time. 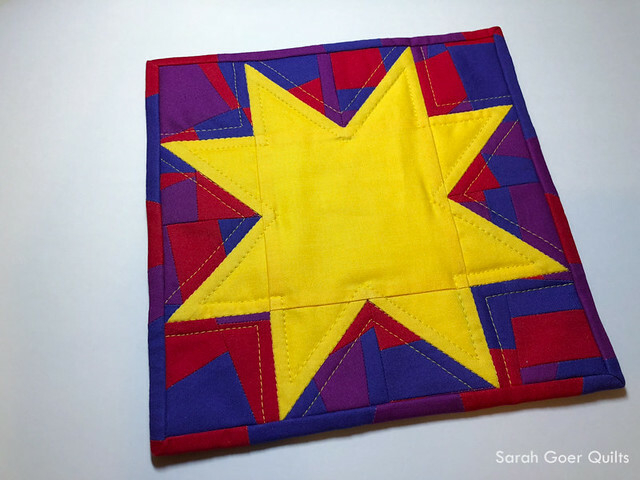 I didn't like the idea of putting a solid yellow binding on it without the borders since the star points would touch the binding. It was clear to me that the right answer was a scrappy binding that would blend with the background. 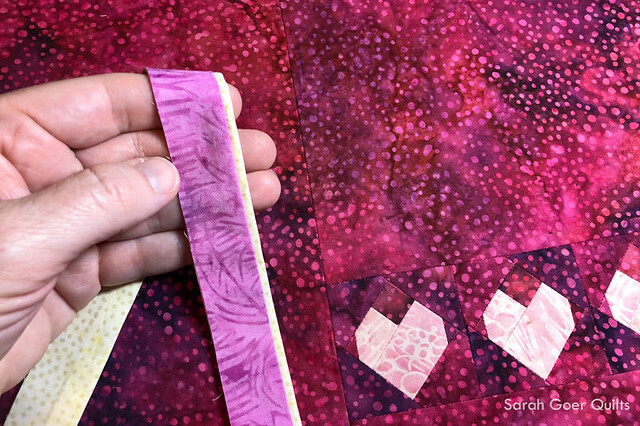 It took a little planning to be sure that my corners wouldn't have seams, and that the binding fabrics weren't matching too much with the background fabrics. Though honestly, it probably would have been faster to build more slab for borders and use a single piece of fabric for binding. That said, I'm thrilled with the results. Not So Mellow Yellow finishes at 8.5" x 8.5". 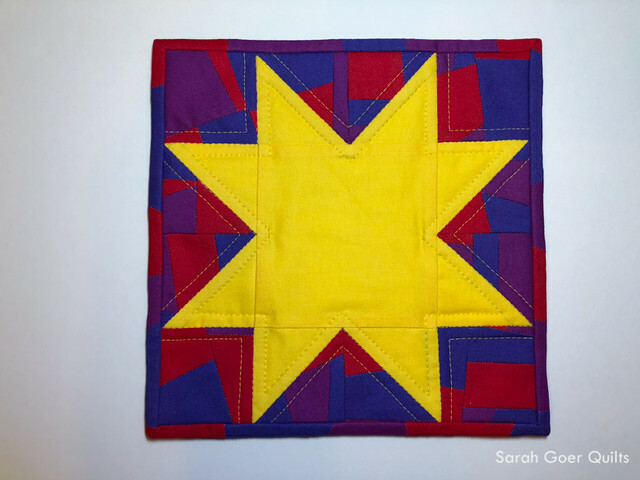 The walking foot quilting was done with 50wt Aurifil #2120 (Canary). Posted in Quilting. 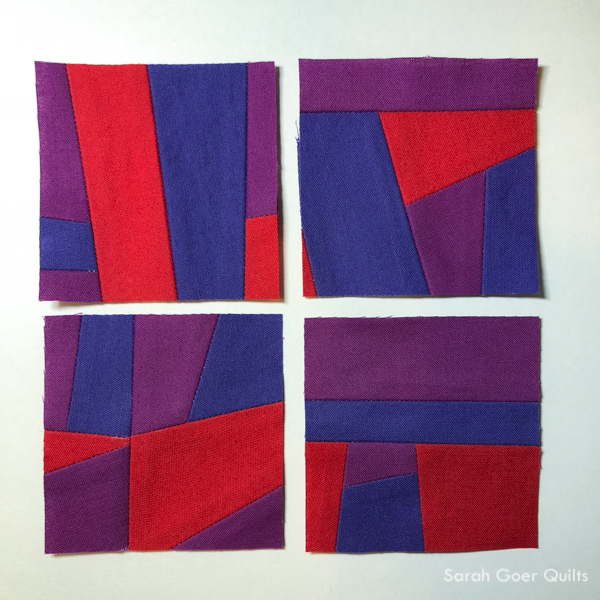 Tags: challenge quilt, finished quilt, mini quilt, Project QUILTING on February 24, 2018 by sarah. QuiltCon 2018 starts next week in Pasadena. I'll be there with my family. Maybe you are attending. Maybe it's your first time. I thought I would share a few tips. 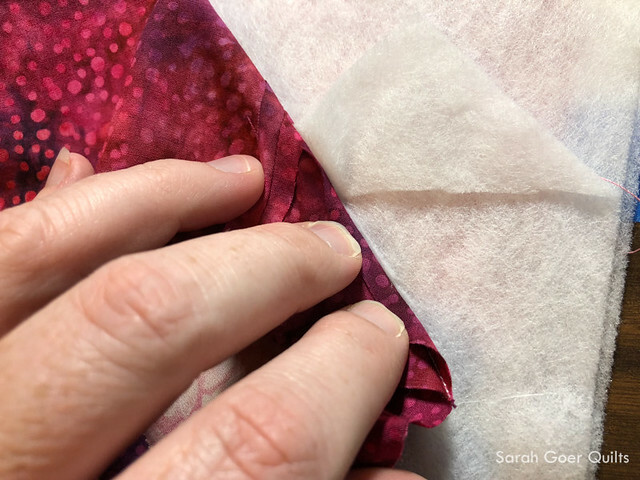 If you have additional tips or questions about QuiltCon, please feel free to leave them in the comments. Lectures are great info and a low price point. They are more likely to have space available at this point. Lecture passes are available for a whole day of lectures as long as no individual lectures that day have sold out. Check the schedule for which lectures appeal to you to see if a day pass makes sense as a way to save over the price of paying for each lecture individually. Be sure to bring paper and pencil for notetaking. Any lecture or panel is sure to be a wealth of info! Schedule time in advance to meet up with people you want to see while you're there. (For walking the show together or a meal, etc.) 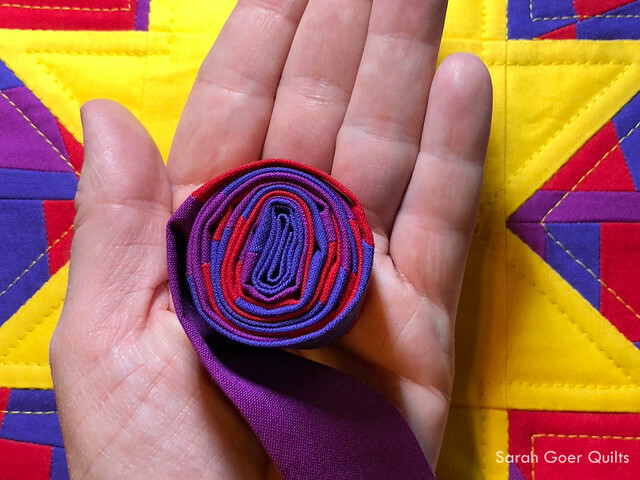 This may include a guild dinner on meeting up with your online quilter friends in real life! I think scheduling in advance is especially important for online friends you want to connect with. A friend and I missed each other entirely in Savannah because we were trying to connect on the fly and were never in the same place at the same time. Now is the time to reach out to the online friends you want to be sure to connect with and make a plan for when that will be. 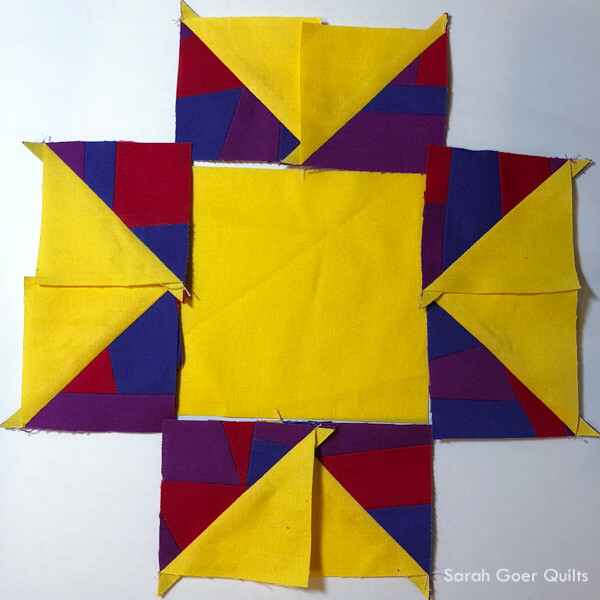 One great option is to plan to meet up at one of the QuiltCon organized evening social events. What have you been most inspired by today? Are you working on a project that you're excited about? Tell me about it. Have you found any fabulous deals in the vendor booths? What's the next thing you're checking out today? The show of quilts in Pasadena is in two rooms. The main room with the vendors and a hall next door. Super close. But be sure not to miss those quilts! And leave yourself plenty of time. There is a lot of very fine work to take in! Also, be sure to make your way through all the vendors booths, as they have many additional amazing quilts to awe and inspire. Remember, that while it's great to take pictures of the show quilts, you should ask vendors before photographing anything in their booth. And be sure to credit makers if you share photos online. Again, quilts in the show are fair game to share, but check with vendors before posting their work. If you aren't taking classes or attending workshops, there is still lots to do! There are demos both in individual booths as well as the main demo area. Many vendors have games and activities in their booths. And don't forget to do some shopping. Be on the lookout for book signing schedules in some booths. Enjoy the warm Southern California weather with a walk or a meal outside. There is convention center food available for purchase, but in Pasadena there are many dining options just across the street in Paseo Colorado, an outdoor retail district. Business/Contact cards -- for connecting with others. Handwork -- for while you're resting or waiting for class/lecture/demo to start. Notebook and pen/pencil -- to keep track of all that is inspiring you! Spending Money -- cause shopping... 'nuf said. Comfortable Shoes -- you'll be walking a lot! Buttons (or stickers) to swap -- don't have buttons, check here to see if there's still time. Aside from those times, I'll most likely be bopping around QuiltCon with my quilter kiddos (ages 5 and 7) who each have a quilt (from Kids Quilt Round Robin) in the Youth category of the show. Let me know if I'll see you there! Posted in Quilting. 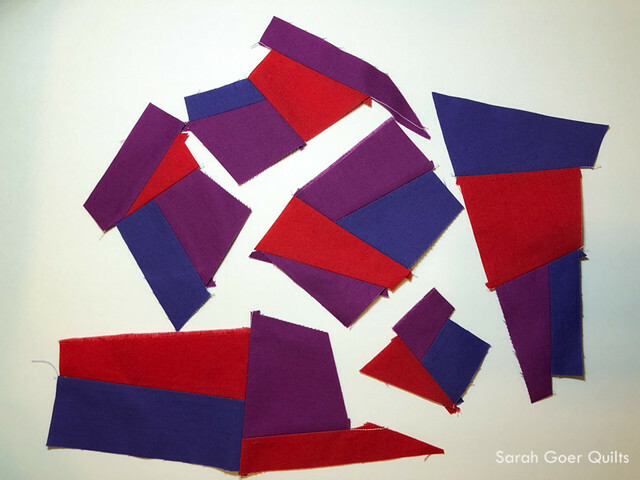 Tags: QuiltCon, QuiltCon 2018, QuiltCon tips on February 15, 2018 by sarah. My second project as an Island Batik Ambassador was to make a small Valentine for a friend. I opted to make two mug rugs in honor of Galentine’s Day, a celebration of some of my best gal pals. 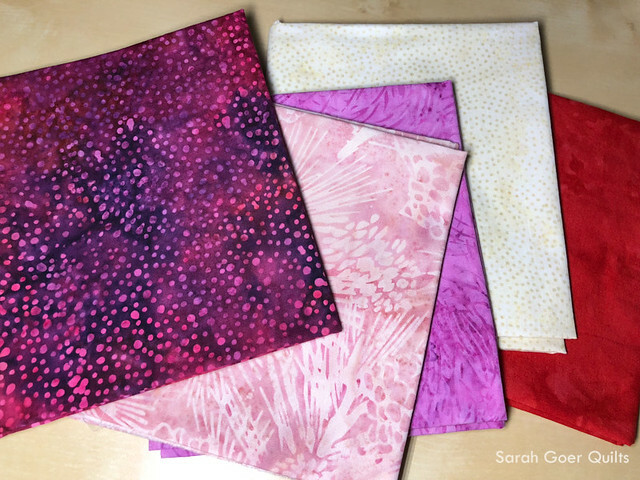 I chose to use four of the fabrics from my Valentine's Island Batik bundle. As soon as I saw the bundle I knew I had to feature the print on the top (which I think is Mixed Berry Mini Dots from the Plum Delicious collection). That's how I chose it for my background fabric. 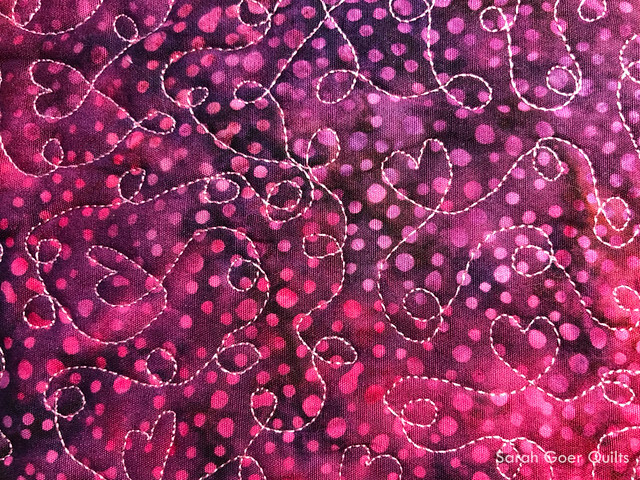 I chose the pale pink for my hearts to contrast the dark tones of the background. 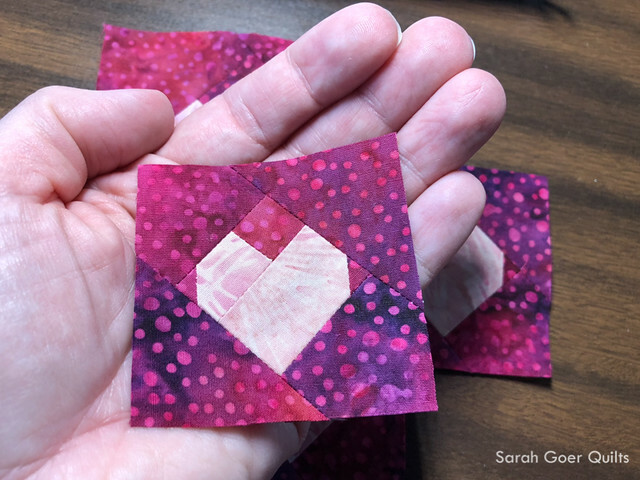 I pieced two sizes of heart blocks. The smaller ones fit in the palm of my hand. 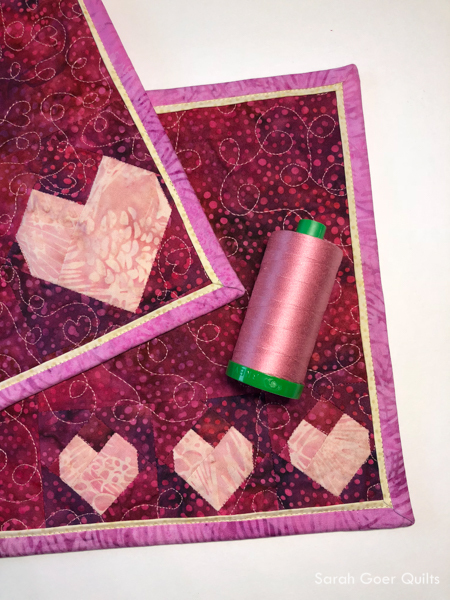 I opted for a triple heart in the small size heart blocks for one mug rug and used a single larger heart for the other mug rug. 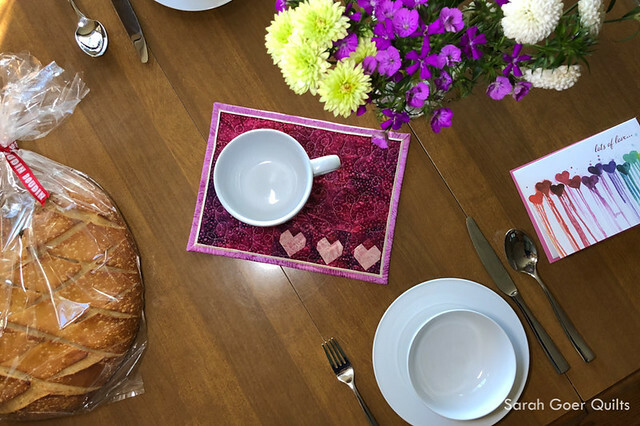 I like the idea of the main design of a mug rug to be on an edge or corner so it can still be enjoyed even with a mug and a snack in place. 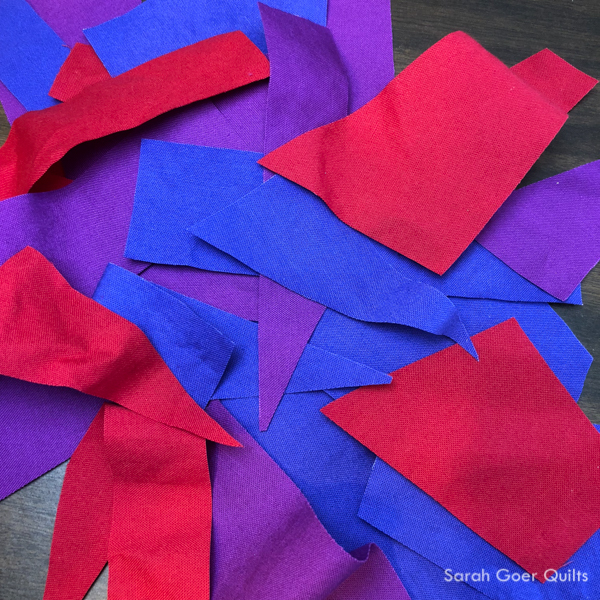 I used the same ultra-thin polyester Thermore Hobbs batting that I used in my last quilt. I'm not sure polyester is the best choice for a mug rug, (anyone have thoughts on that?) but I like the idea that it'll stay flat and not get crinkly when washed. I used one layer of the batting on my triple heart mug rug, and on my single heart mug rug I doubled the batting and added a third layer under the heart. 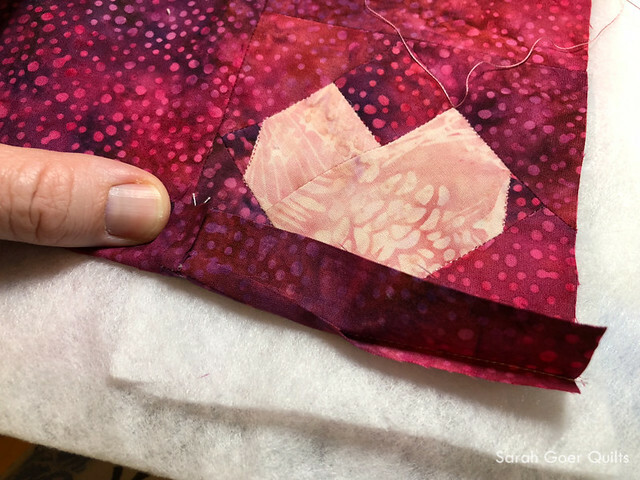 On that quilt, I started the quilting by stitching the perimeter of the heart, then I cut away the third layer of batting as shown below. This gave the heart just a little more puff to it, especially once I added the dense quilting to the background. It's subtle, but I like it. 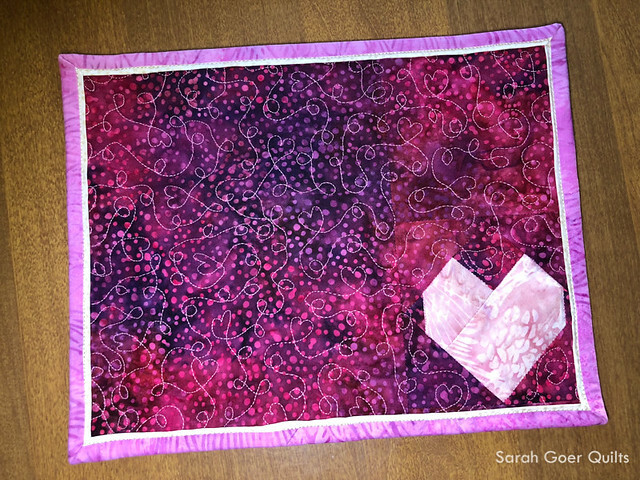 I opted for loops and hearts on this first mug rug and went for pretty dense all over quilting in the background. This was my first time using Aurifil 40wt thread. The Antique Rose (#2430) from my ambassador box was a perfect choice to contrast my background fabric. 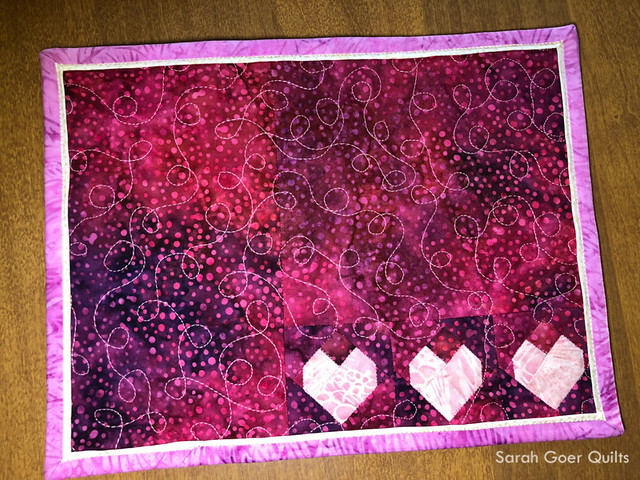 I the second mug rug I omitted the hearts from my design and used a slightly larger scale loop motif. In order to incorporate two more fabrics I made a flange binding. I pieced the cream and pink fabrics for a pink binding with a cream flange. The binding was attached by machine with a Light Beige (#2310) 50wt Aurifil from my stash. These are my 12th and 13th quilt finishes in 2018. The triple heart mug rug finished at 10.5" x 8" and the single heart mug rug is about 10" x 7.75". 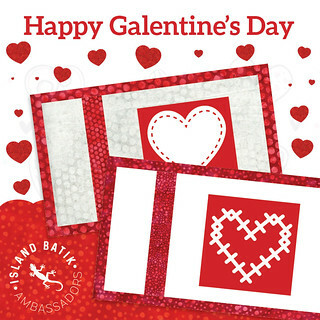 Check out some of the other Galentine's Day projects by my fellow Island Batik Ambassadors. Next month's Island Batik Ambassador challenge is to try a technique that is new to us. Maybe I should have saved my flange binding for next month! ;-) I'm looking for ideas. Leave me a comment below with your ideas for a new technique for me to try. Posted in Quilting. 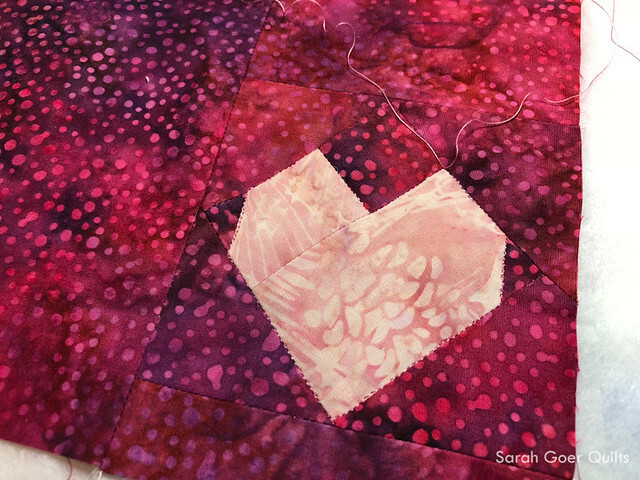 Tags: Aurifil thread, finished quilt, Hobbs batting, Island Batik, Island Batik Ambassador, mug rug, Sarah Goer Quilts on February 14, 2018 by sarah.